Sidekick Backpack: Sidekick Backpacks makes school more fun. The durable exterior can stand up to just about anything – even homework. And the roomy interior helps keep school work organized. Extra-durable 600-denier polyester fabric with padded back for extra comfort and adjustable padded straps. Interior utility pockets and pencil holder with moisture-resistant nylon lining. Measures 15 in. x 12 in. x 7 in. 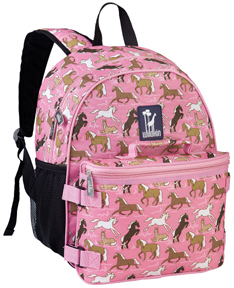 • Sidekick Backpack Horses in Pink: Horses in Pink features a group of whimsically wild horses that prance, dance, jump, and just chill; their brilliant white manes and tails absolutely shine atop the pattern's lovely, timeless pink backdrop. A bestselling Wildkin Classic. Ages 3 - 8. Great gift idea! BUY NOW! 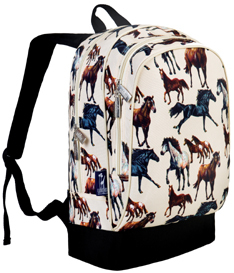 • Sidekick Backpack Horse Dreams:Horse Dreams pattern features a range of horse breeds that are rendered in stunning detail and accuracy. The horses' various movements are gracefully depicted atop a smooth, light taupe background. Ages 3 - 8. Great gift idea! BUY NOW! Crackerjack Backpack: Snap to your day with the Wildkin Crackerjack Backpack. The Crackerjack is perfect for carrying and organizing books, binders, and supplies, or for an overnight adventure. Interior utility pockets and pencil holder with moisture-resistant nylon lining. Adjustable padded straps. Larger than our Sidekick, yet smaller than our Macropak. Measures 16in. x 12in. x 5in. 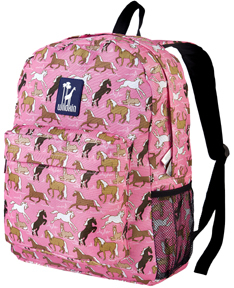 • Crackerjack Backpack Horses in Pink:Horses in Pink features a group of whimsically wild horses that prance, dance, jump, and just chill; their brilliant white manes and tails absolutely shine atop the pattern's lovely, timeless pink backdrop. A bestselling Wildkin Classic.Sized for ages 3+. Great gift idea! BUY NOW! 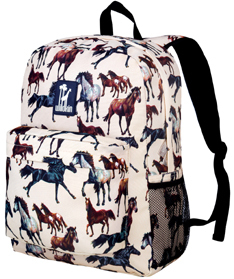 • Crackerjack Backpack Horse Dreams:Horse Dreams pattern features a range of horse breeds that are rendered in stunning detail and accuracy. The horses' various movements are gracefully depicted atop a smooth, light taupe background. Sized for ages 3+. Great gift idea! BUY NOW! 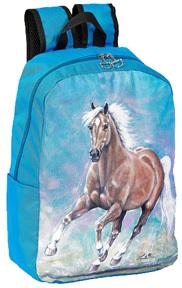 • Pack 'n Snack Backpack Horse Dreams:Pack 'n Snack Backpack combines two products into one economic space. This Backpack features a generously-sized, food-safe insulated front pocket that can be used to stow snacks, lunch, or school supplies. Perfect for preschool, daycare, and day trips. Insulated, easy-to-clean, food-safe front pocket. Front pocket can be used for snacks, lunch, or school supplies and mesh side pocket for water bottle. 2 zippered pockets. Reflective tape on front of bag for night-time safety. PVC, BPA and Phthalate free. Measures 12in. x 10in. x 4.5in. Horse Dreams pattern features a range of horse breeds that are rendered in stunning detail and accuracy. The horses' various movements are gracefully depicted atop a smooth, light taupe background. Ages 2 - 5. Great gift idea! BUY NOW! 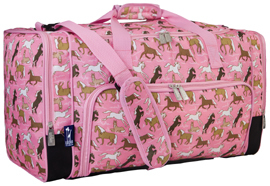 • Weekender Duffel Bag Horses in Pink: If you are looking for great looking kids luggage, look no further than our rolling duffel. The large main compartment holds enough to pack for many days, and construction is durable and built to last. Smooth-rolling inline skate wheels make pulling smooth, even for kids, and the frame is extra durable and built to withstand airline travel and road trips. An outside pocket makes this bag very embroidery-friendly.Extra-durable 600-denier polyester fabric. Interior moisture-resistant nylon lining. Side pocket helps you stay organized. Measures 22in. x 12.5in. x 10.5in. Horses in Pink features a group of whimsically wild horses that prance, dance, jump, and just chill; their brilliant white manes and tails absolutely shine atop the pattern's lovely, timeless pink backdrop. A bestselling Wildkin Classic. Recommended Ages 8+. Great gift idea! BUY NOW! 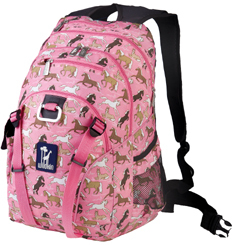 • Comfortpack Backpack Horses in Pink: Super Comfort Backpack is designed to securely hold anything you can carry. The comfort comes from high density padding on each side of the back which keeps most of the weight off of the spine, and adjustable, padded shoulder straps to hold the bag in place.Back made with high density padding and air mesh for extreme comfort. Two-way zip opening into main compartment includes an internal padded laptop compartment with hook-and-loop closure. Includes an adjustable sternum strap and webbing carrying handle. Mesh bottle pockets on each side for bottles. Highly-reflective band for night time safety. Measures 18in.x 12in.x 6.5in. Horses in Pink features a group of whimsically wild horses that prance, dance, jump, and just chill; their brilliant white manes and tails absolutely shine atop the pattern's lovely, timeless pink backdrop. A bestselling Wildkin Classic. Ages 8+. Great gift idea! BUY NOW! 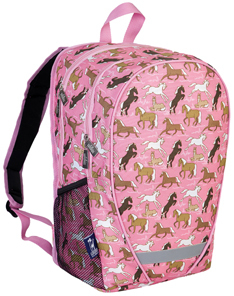 • Serious Backpack Horses in Pink: Horses in Pink features a group of whimsically wild horses that prance, dance, jump, and just chill; their brilliant white manes and tails absolutely shine atop the pattern's lovely, timeless pink backdrop. A bestselling Wildkin Classic.This is Serious. This Serious Backpack is loaded with features and packed with amenities. With a water-resistant lining, each segment has multiple pockets including a padded sleeve to protect your 15 inch laptop or tablet, space for your media device with headphone access. Use the padded waist straps to relieve your back and transfer some of the bag's weight to the hips, and when not in use, tuck the straps away so that they are not dangling. Don't want to carry your lunch box? Use our convenient carabineer and strapping system to secure the lunch box to the back. Or, use the straps for your fitness mat or extra clothing. Tired of drinking warm water or soda? One of our drink holders is insulated and will keep your 20 oz bottle cooler, longer. The Serious Backpack is a smart and savvy option to handle the demands of school hallways, sports fields, and exotic adventures. Bring it on! Measures 18in. x 13.5in. x 8in. Ages 8+. Great gift idea! BUY NOW! BOGO Backpack: Super Comfort Backpack is designed to securely hold anything you can carry. The comfort comes from high density padding on each side of the back which keeps most of the weight off of the spine, and adjustable, padded shoulder straps to hold the bag in place.Back made with high density padding and air mesh for extreme comfort. Two-way zip opening into main compartment includes an internal padded laptop compartment with hook-and-loop closure. Includes an adjustable sternum strap and webbing carrying handle. Mesh bottle pockets on each side for bottles. Highly-reflective band for night time safety. Measures 18in.x 12in.x 6.5in. 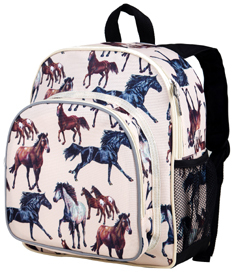 • BOGO Backpack Horses in Pink: Horses in Pink features a group of whimsically wild horses that prance, dance, jump, and just chill; their brilliant white manes and tails absolutely shine atop the pattern's lovely, timeless pink backdrop. A bestselling Wildkin Classic. Ages 6+. Great gift idea! BUY NOW! 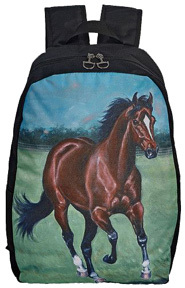 • BOGO Backpack Horse Dreams: Horse Dreams pattern features a range of horse breeds that are rendered in stunning detail and accuracy. The horses' various movements are gracefully depicted atop a smooth, light taupe background.Ages 6+. Great gift idea! BUY NOW! • "Lila" Camo Back Pack GREY & BLUE #GG778GR: Measures 16 H x 11.5 W x 5 D inches. BUY NOW! 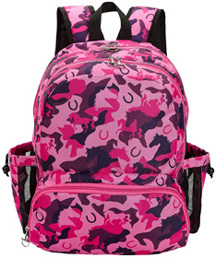 • "Lila" Camo Back Pack PINK & PURPLE #GG778PK: Measures 16 H x 11.5 W x 5 D inches. BUY NOW! 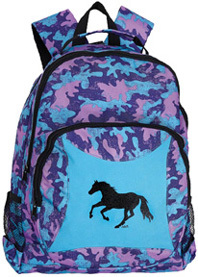 • Camo Backpack Galloping Horse TURQUOISE #GG835: Measures 15.5 H x 12 W x 4 D inches. BUY NOW! 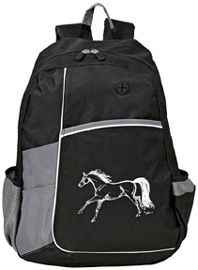 • Drawstring Tote/Backpack Galloping Horse #GG815: Poly 600D & 1200D Drawstring Tote/Backpack with "Lila" Galloping horse. Large main compartment with drawstring closure, front zippered pocket and two large expandable/retractable pockets on both sides. Measures 19 x 18 x 7.5 inches. Great gift idea! ORDER NOW! • "Lila" Suede Backpack NAVY & BROWN #GG776: 600 denier Polyester. Dual zippered main compartment, front zippered pocket, interior accessory pockets and key clip. Drawstring mesh bottle holder and side pocket with Velcro closure. Carry handle and adjustable padded straps. Measures 12 W x 16.5 H x 5D inches. Great gift idea! ORDER NOW! 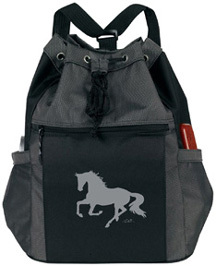 • Metro Backpack Running Horse BLACK & GREY #GG934: Metro Backpack adorned with Lila© Running Horse design. 600 denier polyester with PVC backing. Dual zippered main compartment, interior accessory pocket and slot for ear buds. Three open front pockets, side mesh pocket, padded back straps. Measures 14 W x 18 H x 5 D inches. Great gift idea! ORDER NOW! 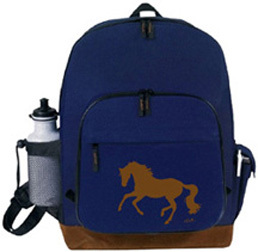 • Galloping Backpack PALOMINO #GG692: "Lila" Galloping Palomino backpack. 600 denier polyester, dual zippered main compartment with nylon lining and side slip pocket. Two outside slip pockets, padded shoulder straps. 12"W x 16"H x 5"D. BUY NOW! 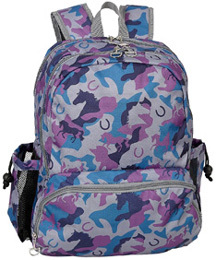 • Galloping Backpack BAY #GG691: "Lila" Galloping Bay Backpack. 600 denier polyester, dual zippered main compartment with nylon lining and side slip pocket. Two outside slip pockets, padded shoulder straps. 12"W x 16"H x 5"D. BUY NOW! 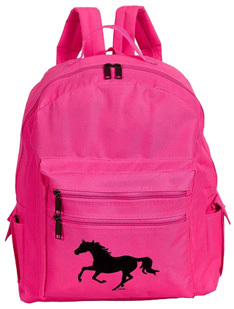 •ALL PURPOSE #GG694: Pink with Black "Lila" Galloping Horse. 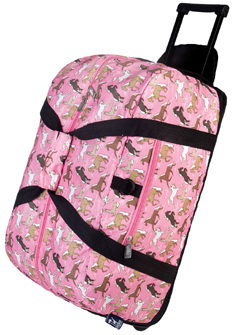 Features adjustable padded backstraps, zippered main and front compartments & velcro closure side pockets. 600D, 13" x 16" x 6". BUY NOW! Rolling Duffel Bag: If you are looking for great looking kids luggage, look no further than our rolling duffel. The large main compartment holds enough to pack for many days, and construction is durable and built to last. Smooth-rolling inline skate wheels make pulling smooth, even for kids, and the frame is extra durable and built to withstand airline travel and road trips. An outside pocket makes this bag very embroidery-friendly.Extra-durable 600-denier polyester fabric. Interior moisture-resistant nylon lining. Side pocket helps you stay organized. Measures 22in. x 12.5in. x 10.5in. 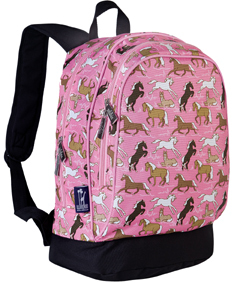 • Rolling Duffel Bag Horses in Pink:Horses in Pink features a group of whimsically wild horses that prance, dance, jump, and just chill; their brilliant white manes and tails absolutely shine atop the pattern's lovely, timeless pink backdrop. A bestselling Wildkin Classic. Recommended Ages 8+. Great gift idea! BUY NOW! 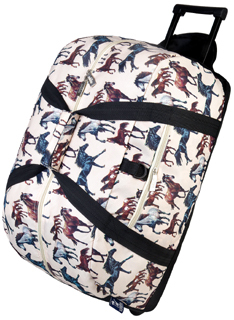 • Rolling Duffel Bag Horse Dreams:Horse Dreams pattern features a range of horse breeds that are rendered in stunning detail and accuracy. The horses' various movements are gracefully depicted atop a smooth, light taupe background. Recommended Ages 8+. Great gift idea! BUY NOW! 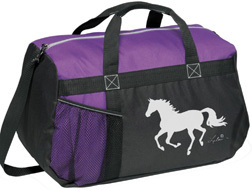 • Duffel Bag Lila Horse PURPLE & BLACK #GG819PU: All-purpose Duffle made of 600D Polyester. Large zippered main compartment and front mesh pocket. Comes with holder strap and grab handles. Measures 18 L X 11 H X 9 W inches. Great gift idea! ORDER NOW! 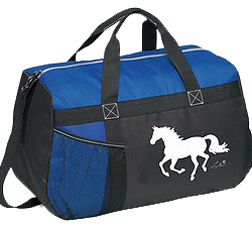 • Duffel Bag Lila Horse BLUE & BLACK #GG819BL: All-purpose Duffle made of 600D Polyester. Large zippered main compartment and front mesh pocket. Comes with holder strap and grab handles. Measures 18 L X 11 H X 9 W inches. Great gift idea! ORDER NOW! 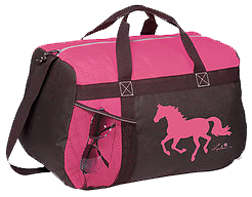 • Duffel Bag Lila Horse PINK & BLACK #GG819PK: All-purpose Duffle made of 600D Polyester. Large zippered main compartment and front mesh pocket. Comes with holder strap and grab handles. Measures 18 L X 11 H X 9 W inches. Great gift idea! ORDER NOW! 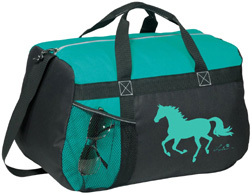 • Duffel Bag Lila Horse TURQUOISE & BLACK #GG819TQ: All-purpose Duffle made of 600D Polyester. Large zippered main compartment and front mesh pocket. Comes with holder strap and grab handles. Measures 18 L X 11 H X 9 W inches. Great gift idea! ORDER NOW! 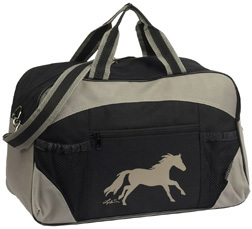 • Duffel Bag Running Horse BLACK & GREY #GG854: 600 denier polyester & ripstop. “U” shaped zippered main compartment, zippered front pocket, large zippered side pocket for shoes, small side accessory pocket. Backside sleeve strap for towel or yoga mat. Padded adjustable shoulder strap. Measures 20 W x 12 H x 12 D inches. Great gift idea! ORDER NOW! 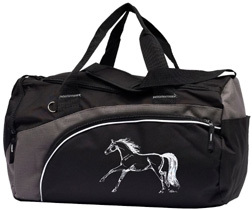 • Duffel Bag BLACK & GREY #GG951: Beautiful Black & Grey Duffle Bag is handy and practical. 600 D polyester Duffle with PVC backing. Large, top zippered main compartment. 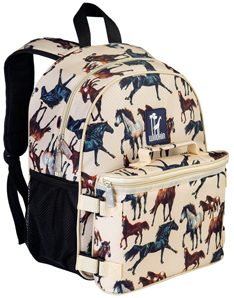 Front zippered pocket, two front meshed holders, adjustable shoulder strap and carrying handles.Fanciful, galloping horse design by artist, Lila Blakeslee is ideal for carrying riding supplies, excursions, travel. Measures 17 W x 11 H x 8 D inches Great gift idea! ORDER NOW!